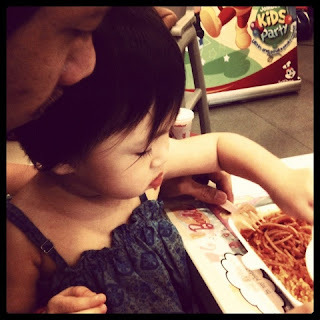 Last weekend (April 14), we were invited to attend Mommy Fleur's unija hija's birthday party at Jollibee! My little girl loves Jollibee so I was so excited too and half wishing na sana may Jollibee mascot! I didn't get to take lots of photos because Y is so makulit. One minute she's enjoying writing on the activity paper, one minute she wants to play with the balloons then the next bored na siya and wants to walk around with me. We don't usually take the yaya with us when we go out, but the next time we will na! Y is getting handful na and with me getting bigger, I can't run around with Y any longer. Sumakit katawan ko the day after haha! Ok, back to kwento. There's a photobooth where we took advantage of kasi nun birthday ni Y, we only had 1 photo ata, and my MIL took it with her so wala kaming hard copy. I love the photobooth, lalo akong pumuti haha! Buti na lang pala I didn't recommend the photobooth we had during Y's party to Fleur hehe! Y didn't get to join any games because she's too small pa. We watched na lang from our seats pero ang kulit ni Y. She wants to walk around! Pabalik-balik kami. But we still enjoyed watching the games very much! Ang cute ni Jollibee! Watching the program from afar! The highlight for Y was seeing Jollibee in person. I thought she'd be scared, but NO. Mega-Hi siya! Too bad ayaw magpa-picture mag-isa with Jollibee! But she kept on following Jollibee, playing peek-a-boo with him. Ang cute nilang dalawa! Hetty was there too! Then food was served na! We had spaghetti, Jolly Hot Dog (which I had for the first time), fries, sundae and iced tea! Enjoy din si Y sa spaghetti! She rarely eats fast food kaya ayan! She wants to eat by herself pa, with matching subo sa papa niya at sa akin. Fleur, thank you again for having us!!!! Happy Birthday Anika! May you have more birthdays come and may you grow into the lady that your parents want you to be! Thank you so much for coming Cai! I finally met your hubby and Y was really adorable!!! Next year, sasali na si Y sa games for sure!!! Thanks again Cai! See you guys again next year! We had 2 photobooth pictures! I love the photos! :) See you again Fleur! In June or July, mag Cotton On tayo!